Hostel accommodation, up to two people. 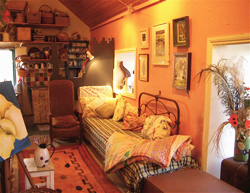 A resource for local artists and art, Tin Jug studio is available to rent for gallery openings and studio hire. A low commission is charged on exhibition sales. Please enquire about costs, space-dimensions, and the various options. Tin Jug Studio is also available seasonally to artists, for short residencies. Work/stay self-catering, or B&B in the house and work in the studio. There is a small kitchen area with microwave, electric cooker and mini-fridge; a shower bathroom, and platforms in the open-plan studio which configure from 'sofa' into two comfortable single or one double sleeping area with foam mattresses. A little balcony upstairs, overlooks the courtyard garden. The studio space has good daylight, lovely evening light and lots of electric spotlights. Downstairs, the gallery has the feel of a traditional cottage, with a settle-bed and seating and is heated by an electric stove 'fireplace'. It is warm and cosy but also airy. The studio has its own off-street entrance to the garden. The studio is also available to visitors and tourists for two-night stays, as self-catering accomodation. Prices: Please see the Events Page for seasonal offers, or enquire about prices through e-mail or by phone.